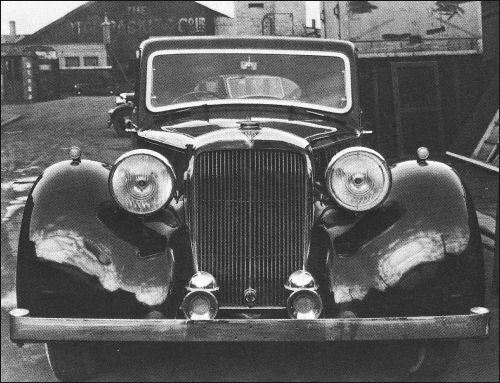 Alvis Fourteen Saloon is the Company's only model in production during 1946. It is a new and beautifully proportioned four-door four-light model, powered by a four-cylinder 1892-cc (74 x 110 mm) 65 bhp OHV engine, driving through a four-speed gearbox. Wheelbase is 9 ft, tyre size 6.00-16 with 16" disc wheels in place of 17" wires. Top speed is 75 mph. Alvis Fourteen is available as a four door Saloon by Mulliners of Birmingham The body is mounted on an updated pre war Alvis 12/70 chassis that is widened and lengthened but retained the non-independent leaf spring suspension and mechanically operated brakes. Disc wheels replaced the 12/70s wires. The 1,892 cc engine is a slightly larger bore version of the one used in the 12/70 and produce 65 bhp. It is fitted with a single SU carburettor. The top speed is around 74 mph. TA14 - pre-war 12/70, re-launched in 1946. Standard body is four door sports saloon.